Two surfing scenes, an ice palace, dodgy effects and a warbling Madonna all add up to this – Pierce Brosnan’s final Bond film. Roger Moore, noted ham and by far the most flamboyant Bond, said of Die Another Day: “I thought it just went too far – and that’s from me, the first Bond in space!” When I first saw it I hated it with the fire of a thousand suns. The song is great for 16 seconds and then Madonna starts singing. She’s a pop artist and great at pastiche, but here her vocal stylings are woefully inadequate. The lyrics are mind-numbingly horrible as well, full of non-sequiturs like “Sigmund Frued / analyse this / analyse this”. I don’t think it’s a stretch to say that this is the worst Bond theme yet and will make you and your loved ones stupider for having heard it. Bond surfs into frame in the first indicator that Die Another Day is leaving all reality behind. 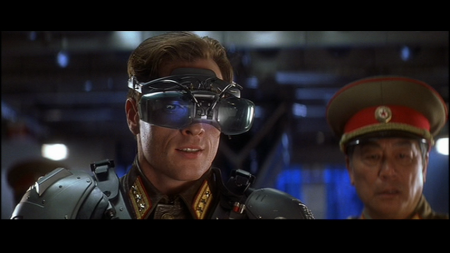 007’s in North Korea, looking to trade conflict diamonds with the brutal warlord Colonel Moon. The exchange goes sideways as Bond grievously injures Zao (Rick Yune) and seemingly kills Moon during a lengthy hovercraft chase through a live minefield. Bond is subsequently captured and (in a franchise first) the movie continues throughout the credits sequence as Bond is tortured for information against a superimposed backdrop of writhing ladies. 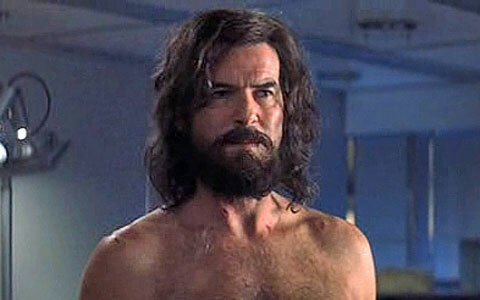 Hobo Bond in all his hirsute glory! Cut to 14 months later and a very hairy (hobo-like) Bond is released in exchange for Zao in the demilitarized zone. 007 returns home, embittered and unsure of his position within the secret service. He basically goes rogue, escaping his hospital confines and looking for revenge against Zao and whomever in MI6 betrayed him. His search leads him to Cuba, Iceland, the United Kingdom and back to North Korea as pursues Gustav Graves – a wealthy British industrialist who’s harnessed the power of the sun with a giant frickin’ laser beam. Gustav Graves is a fun concept – a Richard Branson-like entrepreneur whose outwardly benevolent veneer hides his craven lust for power and wealth at all costs. Actor Toby Stephens has an eminently punchable face and his lip snarl is second to none. The ridiculous twist (one of many homages to former Bond films, this time Mr. Big in Live And Let Die) is he’s actually Korean Colonel Moon, having undergone extensive “gene therapy” to convert him into a ginger Brit. Zao is his second-in-command and main henchman, sporting a bald pate and embedded diamonds in his face. Other than his unique look, he doesn’t get to do much beyond threaten Bond with a permanent sneer. Most of the action is severely underwhelming, over reliant on shoddy effects and lacking in gravitas. Bond surfs not once but TWICE, pilots a rocket car AND an invisible car, effortlessly dodges all of the bullets all of the time, and generally just exists in a movie that throws logic, physics, internal consistency and all sense of weight or impact out the window in a callous and crass attempt to one-up previous Bond movies. Like Tomorrow Never Dies, Die Another Day again pairs Bond with a supremely capable female counterpart in the form of Halle Berry’s Jinx. And while Jinx’s entrance (which pays homage to the immortal Ursula Andress emerging from the water scene of Dr. No) is stirring and full of promise, much of that potential is squandered by a tone-deaf and broad performance by Berry that in all fairness has her saddled with terrible dialogue as well. Unsurprisingly, a planned spinoff movie never materialized. The other love interest for Bond comes in the form of Miranda Frost, played by a young pre-Gone Girl Rosamund Pike. Covertly working for M to keep tabs on Bond, she proves to be a worthy foil for 007 but is turned into a stock villain once it’s revealed she’s actually in league with Graves (she likes to win at all costs too). She gets a climactic fight scene with Berry’s Jinx, but like much of the movie the action is muddled and unconvincing. Uninspired direction (lots of unnecessary slow-mo), cheap sets (the ice hotel being the worst offender), terrible effects and a generally listless story all combine to create the perfect storm of the worst Bond film. The 20th film in the series, Die Another Day is jam-packed with references to all the previous Bonds but is devoid of their heart and soul. This is soulless franchise filmmaking at its worst and to me represents a nadir in the series. Brosnan ends his run much like Connery and Moore before him, with his worst entry being his last. It would take four years and a certain controversial casting choice (Blonde bond? Sacrilege!) to revive the series and wash the bad taste of Die Another Day away.